PMT can assist with variety of soil mapping applications through the use of remotely sensed data, aerial photography, and field techniques. The following is an example of a PMT soil mapping project. Contact us for more information about soil mapping services. The Hopi Tribe, Water Resources Program, retained Pinnacle Mapping Technologies, Inc. to conduct further assessment of the PIA (Practical Irrigable Acreage) map produced in 2002. This effort focused on two primary objectives. The first goal involved looking at the NRCS soils map and comparing their soil texture determinations with the PIA map. 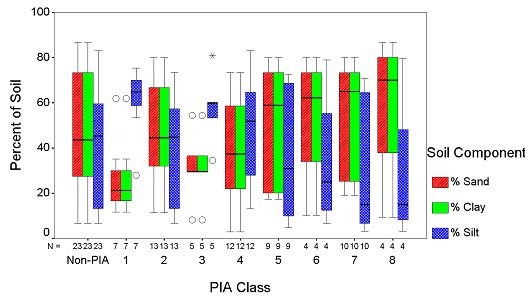 The second objective focused on comparing PIA and in situ soil composition.